Digital Millennium copy right Act ( DMCA ) may be controversial from the initial days of that act itself. This blog post is not an effort to check the merits and demerits of DMCA , but rather considering the DMCA from a normal bloggers point of view . Why you should care ? As a technology writer , I know how hard it is to convert a basic idea in your mind to words and write an article. English is not my primary language and that makes this process even harder. So it is really painful to see that your hard work is just lifted by another blogger and pasted on their site with out even giving credit to the original author. Newer technologies make it really easy for anyone to infringe the copyrighted work and make it their own. This kind of Plagiarism is often ignored by the original author because he does not know any effective method for preventing it . May be the content thief is residing on another country protected by the geographical factors and the laws applicable to his country. Internet is not an anonymous world. It is really easier to check if anyone copied your content to their website . Just a Google search with the suspected content will reveal who lifted your content. But what action you are going to take against the person who lifted your content ? Here comes the significance of DMCA . You can file a DMCA complaint against the person who copied your content . If he is a blogger blogging on free platforms like blogger.com or wordpress , you have the option to file a report and they will take care of it. If you are accusing a company or person who runs a website with your content , you can file a DMCA with their hosting provider. The hosting provider will take it seriously and will remove the suspected content if they found that the allegation is correct in prima-facie . Another way of protection involves letting know the would be content lifters that you are taking the matter of content copyright seriously by displaying the badges against copyright violation on your site and tracking your content regularly for any kind of reproduction on internet . 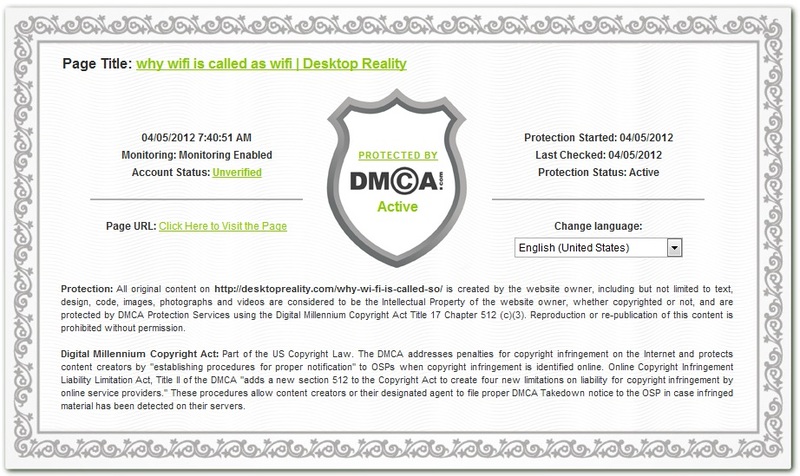 The primary site for it is dmca.com it self which make it easy for us to do the DMCA Protection & Takedown Services. download the badges for your site here and place it on your website. Create a basic account for you on the DMCA site and use wordpress or blogger plugins to display badges and certificates of your posts . dmca.org may not be the ultimate thing to protect your contents on internet . But at least you are telling the world that the content is your hard work and you will mind if someone just do a copy and paste.